Hurricane Irma is one of the most powerful in history, but it's not the first time Florida has gotten slammed. Hurricane Irma, the most powerful storm ever to come out of the Atlantic, made landfall in Florida on Sunday morning as a Category 4 storm. That’s after it tore through the Caribbean, leaving at least 22 people dead on the islands. But the Sunshine State is no stranger to hurricanes. In 1992, Hurricane Andrew made landfall as a Category 5 storm near Miami, with wind speeds of 145 miles per hour. Sunday morning, Irma's winds clocked in at 130 mph, but the storm's wind speeds previously reached 185 mph. Related Story What Exactly Is Storm Surge, And Why Does It Have Floridians Worried? Irma is also massive. It's about twice the size of Andrew. Irma has also been compared to Hurricane Charley. The National Oceanic and Atmospheric Administration described the 2004 storm as "small but powerful." Charley made landfall in Florida as a Category 4 storm with 150 mph winds. It caused about $15 billion in damage, joining Andrew on the list of the top 10 costliest cyclones to hit the U.S. mainland. But perhaps the most accurate comparison to Irma is a storm we don't hear much about — The Great Miami Hurricane of 1926. 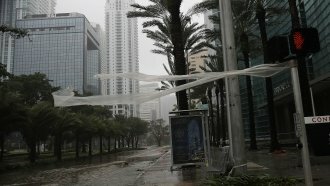 That hurricane had a nearly 15-foot storm surge and damaged or destroyed every building in downtown Miami. More than 370 people died. The National Oceanic and Atmospheric Administration estimates that adjusting for inflation, the Great Miami Hurricane caused $164 billion in damage. That would make it the most expensive hurricane ever to hit the U.S., exceeding damage estimates from Hurricane Katrina by $56 billion.